I can now officially bake cakes (according to Wilton). This was my final cake for my Wilton classes. 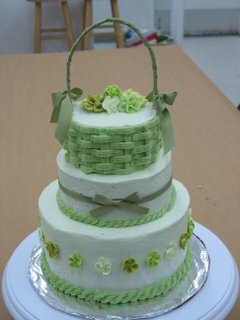 We practiced the basketweave pattern. Because it can be a time-consuming pattern I chose to do on the smallest cake. 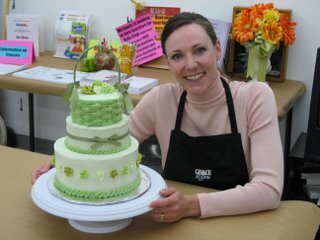 This was also my first monochromatic cake. I really enjoyed the classes but I'll enjoy baking cakes for fun even more. That's really pretty. It looks like it should be filled with Easter eggs!